Bombay Special Vada Pav is a street food cart in Chickpet that’s making us drool with its Bombay-style vada pavs, some in unconventional flavours, and their authentic Gujarati dabelis. While we were getting our shopping done, on the bustling streets of Chickpet, we worked up quite an appetite and decided to explore the street food scene. That’s when we came across Bombay Special Vada Pav, a tiny food cart with bright red signage listing out their menu. 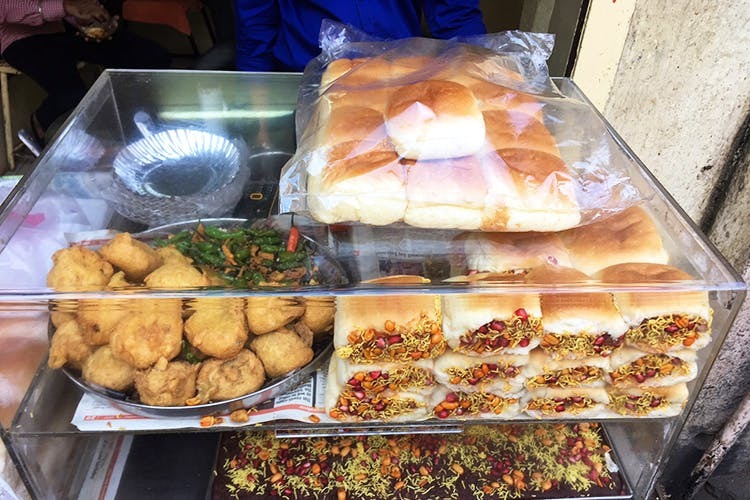 Around for two years apparently, this vada pav station is a one-man army serving up Bombay-style vada pavs with crispy batata vadas stuffed between soft and buttery pavs. Their menu has just four options. You can munch on plain Jane vada pavs, opt for their cheese vada pav or the spicy Szechwan option if you’re feeling adventurous. The cart is a little hard to find, but it’s on Dharmaraya Swamy Temple Road, that’s right on Nagarthpete. You should find it when you get here, or just let Google Maps guide you. And it’s not just vada pav that’s on offer here. Load up on some dabelis too. The most popular is the traditional, old-school Kacchi Dabelis, that’s nice and spicy and with a tangy tamarind chutney. He even generously garnished it with pomegranate. If you want more, then pick the cheese option. Don’t want the dramatic trimmings? Fear not, there is a Jain variant that’s free of potatoes, onions and garlic, just plenty of cheese. Priced at just INR 20 for each, fill up your belly with as much as it can handle without going broke. Head on down to Nagarthpet Main Road and munch away on these quick bites. Don't go expecting a proper place to sit. In fact, you won't even get parking in the area so make sure you have a runner to jump off the bike or car, get your treats and carry on with life! We must warn you that this is for those with iron stomachs. If you’re not big on street food, give this one a miss.